KANSAS CITY, Mo. (AP) The Kansas City Chiefs proved Monday night they can play a little defense, too. The same group that struggled to contain the Steelers and Raiders in back-to-back losses shut down Denver, picking off Trevor Siemian three times, picking up two fumbles and taking one of them back for a touchdown in a 29-19 victory over their AFC West rivals. It was precisely the kind of dominant performance the Chiefs (6-2) needed against the Broncos (3-4), whose own league-leading defense held Alex Smith and Co. in check all night. Harrison Butker kicked five field goals for Kansas City, and Smith threw for 202 yards and a touchdown. Most of it went to Travis Kelce, who hauled in seven balls for 133 yards and the score. But it was the turnovers that proved to be the difference in the game. Siemian finished 19 of 36 for 198 yards and a touchdown, and has now thrown eight picks and only three TD passes in the past five games. The Broncos have lost all but one of them. The only difference was Charles, who went to four Pro Bowls with the Chiefs, was back in Kansas City with the Broncos. And the TD came when the opportunistic Marcus Peters stripped him, picked up the loose ball and returned it 45 yards for the opening score. 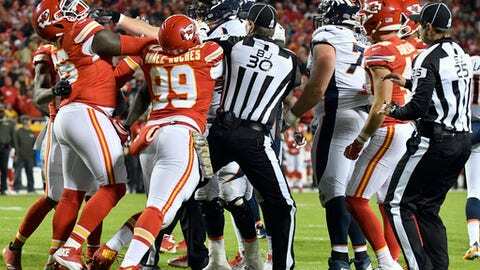 ”That definitely changed the dynamic of the game,” Chiefs defensive tackle Chris Jones said. ”I want the ball every single play. That’s just how I grew up playing,” he said. The Chiefs were threatening to put the game out of reach later in the first quarter when Reid got cute with the play-calling. Rather than keep the ball in the hands of Smith, who hasn’t thrown a pick all season, he let wide receiver Tyreek Hill throw it – and he was intercepted in the end zone. Still, Kansas City led 20-3 when the Broncos’ offense finally found some rhythm. They marched 60 yards to set up their second field goal by Brandon McManus, and then capped an 80-yard drive with Booker’s touchdown run. It was just the second time Denver had reached the end zone in 13-plus quarters, but it got Joseph’s team within 20-13 with a quarter to play. Butker answered with another field goal, and the Chiefs defense held on fourth-and-4 near midfield to get the ball back. Butker added two more field goals, the last with 4:41 left, giving him 18 straight made attempts and putting the game out of reach. Broncos WR Emmanuel Sanders (ankle) and LB Todd Davis (ankle) were inactive, as was Chiefs RG Laurent Duvernay-Tardif (knee). Kansas City lost WR Albert Wilson (hamstring) and OLB Dee Ford (back) in the first half and neither returned to the game. The Broncos activated LB Shane Ray and the Chiefs activated CB Steven Nelson before the game. Ray returned to the lineup after missing the first six games with a torn ligament in his left wrist, while Nelson had been on injured reserve following core muscle surgery. The Chiefs renamed the broadcast booths at Arrowhead Stadium for Hall of Fame player and broadcaster Len Dawson before the game. The 82-year-old Dawson led the Chiefs to victory in Super Bowl IV. He is retiring from work as a radio color analyst after the season. Broncos: Visit Philadelphia on Sunday. Chiefs: Visit Dallas on Sunday.